Background A single cultured marine organism, Nanoarchaeum equitans, represents the Nanoarchaeota branch of symbiotic Archaea, with a highly reduced genome and unusual features such as multiple split genes. 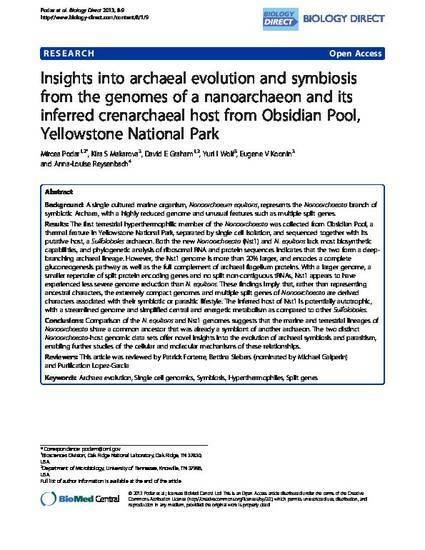 Results The first terrestrial hyperthermophilic member of the Nanoarchaeota was collected from Obsidian Pool, a thermal feature in Yellowstone National Park, separated by single cell isolation, and sequenced together with its putative host, a Sulfolobales archaeon. Both the new Nanoarchaeota (Nst1) and N. equitans lack most biosynthetic capabilities, and phylogenetic analysis of ribosomal RNA and protein sequences indicates that the two form a deep-branching archaeal lineage. However, the Nst1 genome is more than 20% larger, and encodes a complete gluconeogenesis pathway as well as the full complement of archaeal flagellum proteins. With a larger genome, a smaller repertoire of split protein encoding genes and no split non-contiguous tRNAs, Nst1 appears to have experienced less severe genome reduction than N. equitans. These findings imply that, rather than representing ancestral characters, the extremely compact genomes and multiple split genes of Nanoarchaeota are derived characters associated with their symbiotic or parasitic lifestyle. The inferred host of Nst1 is potentially autotrophic, with a streamlined genome and simplified central and energetic metabolism as compared to other Sulfolobales. Conclusions Comparison of the N. equitans and Nst1 genomes suggests that the marine and terrestrial lineages of Nanoarchaeota share a common ancestor that was already a symbiont of another archaeon. The two distinct Nanoarchaeota-host genomic data sets offer novel insights into the evolution of archaeal symbiosis and parasitism, enabling further studies of the cellular and molecular mechanisms of these relationships.